Water Chiller SystemsNewsR-22 vs R-410A – Why Was R-22 Refrigerant Phased Out? The stratospheric ozone layer shields the Earth from the sun’s harmful ultraviolet radiation. Emissions of certain synthetic chemicals – including CFCs, halons, and HCFCs (R-22) – destroy the ozone layer, and have created an “ozone hole” over the South Pole. Through the Montreal Protocol on Substances that Deplete the Ozone Layer, the United States committed to a collaborative, international effort to regulate and phase out ozone-depleting substances. While the US phased out of CFCs and halons in the mid 90’s, we now must first limit HCFC consumption to a specific level and then reduce it in a step-wise fashion. 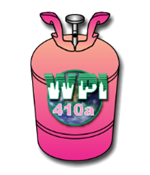 Unlike alkyl halide refrigerants that contain bromine or chlorine, R-410A (which contains only fluorine) does not contribute to ozone depletion, and is therefore becoming more widely used, as ozone-depleting refrigerants like R-22 are phased out. However, it has a high global warming potential (2088 times the effect of carbon dioxide), similar to that of R-22. Since R-410A allows for higher system efficiencies than an R-22 system, by reducing power consumption, the overall impact on global warming of R-410A systems will be substantially lower than that of R-22 systems due to reduced greenhouse gas emissions from power plants. Ban on remaining production and import of HCFC-22 and HCFC-142b. After 2020, the servicing of systems with R-22 will rely on recycled or stockpiled quantities.